My primary mission is to provide discriminating consumers with fine furniture and decorating accessories of unsurpassed quality, and to do so with honesty, integrity and professionalism. Superior service is my specialty. One of my secondary goals is to share my knowledge with others so that they can embrace and enjoy this very rewarding and creative craft. most respected fine woodworking magazine. Hendrik Varju, owner of Passion for Wood, is a professional designer and custom builder of fine furniture. From his country workshop, located in Erin, Ontario, Canada, all of his work is done on a custom order basis, with the client getting directly involved in the design process. Of course, Hendrik also has a portfolio of past projects from which clients can choose and make alterations as desired. His style is to use subtle designs to bring out the natural beauty of wood. Using only the highest quality materials, both solid wood and veneers (as appropriate), he uses time-tested joinery techniques such as mortise-and-tenon joints and hand-cut dovetails. Even where simpler joinery methods are required due to budgetary constraints, he ensures that all joints are strong and that every piece becomes an heirloom quality piece. Although Hendrik has his own personal style, he is not afraid to tackle new projects of a different style – after all, he is a custom furniture builder. He single-handedly takes the client through the entire design process, from initial brainstorming for ideas, to design work and drafting of plans, to planning of joinery methods, and finally to the actual building, finishing and delivery stages. In fact, he prides himself on the quality of his work, both from an aesthetic point of view and in terms of structural integrity. He is well-versed in wood science and technology and takes wood movement into account in all designs. Hendrik will also build reproductions of well-known styles, one of his favourites being Arts-and-Crafts or Stickley style work. Most of Hendrik’s work uses hardwoods, although softwoods are certainly an option. Some of the wood species he most commonly uses are: black cherry, black walnut, red oak, quarter-sawn red oak and red maple. However, he is open to working with any commercially available species and has also done work using Honduran mahogany, European ash, Spanish cedar, western red cedar, aromatic cedar, clear eastern white pine, European beech and purpleheart. Although wood is obviously his material of choice, he has successfully used other materials in his designs as a complement to wood, such as cast iron, wrought iron, stainless steel and glass. He is pleased to work in collaboration with other artisans should the client wish to design a piece that incorporates other materials. In addition to designing and building new furniture, Hendrik has taken on numerous repair and restoration jobs, bringing new life to worn-out antiques. All finish stripping is done by hand, avoiding the problem of failed glue joints and lifted veneers so often caused by commercial stripping methods. Furthermore, Hendrik’s “overfinishing” technique (known as true restorative finishing) can often accomplish remarkable results without stripping the old finish off at all. Often, old finishes can be revitalized and renewed without stripping, as long as the surface underneath the finish is in good repair. He always strives to give the piece a refreshed look without losing the aged characteristics which make old furniture so desirable. Hendrik also offers French polishing in his repertoire, which is a time honoured finishing technique very few people practise anymore. So you if you have a French polished piece that is worn and needs to be livened up again, Hendrik can French polish it to make it look absolutely spectacular again. Aside from his furniture design work, Hendrik also directs his energy towards teaching, which is one of his other passions in life. Hendrik runs his own private woodworking school. He provides one-on-one woodworking instruction in his own workshop, giving woodworking enthusiasts the opportunity to build their own piece with his minute-by-minute guidance. His lessons are customized to each student’s needs and he welcomes beginners as well as experienced amateurs. He also actively encourages women to get involved in this rewarding craft. In addition to on-going weekly or bi-weekly instruction, Hendrik offers a week-long intensive woodworking course, also taught on a one-to-one basis. For a 40 hour week, the student builds a beautiful cherry side table with tapered, fluted legs. He teaches the student about furniture design, wood science, use of woodworking machines, strategies to achieve high quality work and finishing. It is a wonderful, intensive experience in which the student lives and breathes (literally!) fine woodworking for a full week. Beyond his project-based courses, Hendrik also offers fully customized intensive courses, which he has now developed into a formal teaching program that can span from 5 to 30 days in length. Hendrik calls them his “Buffet Style” customized intensive courses, as the student can pick and choose from a long list of topics to piece together a personalized skills-based woodworking experience. Lastly, Hendrik offers on-site woodworking instruction in your own workshop. Hendrik has taught many people and helped them set up their own home workshops, all over the greater Toronto area, right up to Huntsville and Parry Sound, Ontario, and even out to Calgary, Denver, New York and Houston. His furthest destination for on-site instruction was the south of France, where Hendrik taught a one-week private course in September 2004. Contact Hendrik for information on travel rates. One of the other services Hendrik provides is woodworking seminars, both public and private. On the public front, Hendrik presents seminars at woodworking shows, where he will educate a large audience about the finer points of woodworking. 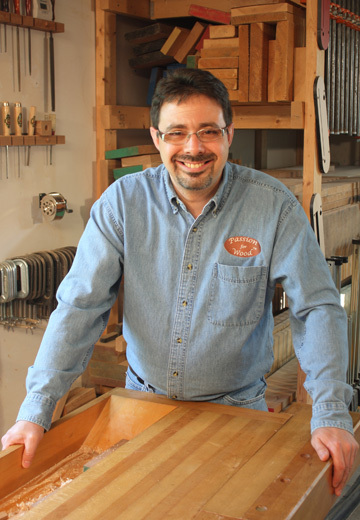 Some of the topics he has covered are “Wood Science 101”, “Finishing in the Home-based Workshop” and “Sharpening Plane Irons and Bench Chisels”. However, Hendrik also conducts woodworking seminars in his own workshop, on many Saturday mornings from September to June. Some of the topics are more theoretical or design related. Other seminars deal with the use of a certain woodworking machine or one particular technique. Joinery methods are also covered from time to time, such as hand-cut dovetails, mortise-and-tenon joints, using dowels in your work, etc. Hendrik will also set up private seminars for groups of people such as woodworking clubs or associations. Or perhaps you just have a group of friends with a common interest. You should be aware that the seminar format involves the demonstration of various techniques with no hands-on time. The main purpose of the seminars is to introduce you to certain techniques or concepts, demonstrate how a particular task is done, and answer any of your questions. If you are looking for in-depth learning/training and a chance to hone your skills with Hendrik, one-on-one instruction is vital. Please note also that Hendrik holds one all-day seminar each summer on the topic of “Starting and Running a Woodworking Business”. See the Testimonials section of this website for comments on these seminars. If you are unable to attend Hendrik’s business seminar, please note that his seminar materials are now available for purchase. Click here to read about Hendrik’s self-published book entitled “Starting and Running a Woodworking Business”. Finally, click on the Seminars page to read about Hendrik’s 6-part seminar series on building a traditional European workbench. His next session is already planned to begin again this September. The Testimonials page also features comments by some recent participants. If you are interested in attending any of Hendrik’s seminars, ask to have your e-mail address added to his database. You will receive regular notices about upcoming seminar dates and topics. Whether you are from Toronto or the GTA, Mississauga, Brampton, Georgetown, Oakville, Guelph, Kitchener-Waterloo, Cambridge, Burlington, Orangeville, Caledon or even beyond, it is an easy drive to Acton to attend woodworking classes. People have travelled to Hendrik’s workshop for private woodworking lessons from all across the country and even the U.S. and Europe. For half-day woodworking seminars, people generally attend from as far away as Windsor and London to the west, Oshawa and Peterborough to the east, Niagara Falls to the south and Huntsville and Owen Sound to the north. Hendrik also provides professional advice, on an as-needed basis, to do-it-yourselfers who do not wish to take formal lessons. Learn how to purchase your lumber, how to choose an appropriate stain and finish, how to properly prepare the surface before finishing, how to apply finishes without complicated equipment and achieve a professional result, tool purchasing advice, design tips, etc. Another service provided at Passion for Wood is professional product testing. While Hendrik has tested various woodworking tools and products in his magazine writing work, he has also entered into independent prototype testing and product comparison tests for various corporations, including Canadian tool manufacturers and a major European finish and adhesive manufacturer. Please contact Passion for Wood for a customized quote on your project. expert reports. Hendrik is able to consult with you and provide a report that can assist you with furniture or tool related disputes. Litigation involving defective furniture, repair work or even machinery related injuries are just a few examples of situations where an expert report can be vital. Insurance claims are another common situation where a formal damage report can make all the difference.